As we swelter through another Northeastern summer, and read the media reports about global warming, it's hard to comprehend that the Earth is actually much cooler than it was at the end of the Cretaceous, 65 million years ago. Today, the average global temperature is around 14 Celsius - that's just over 57 Farenheit for those of you (line me) who can't think metrically - which is frankly a little on the cool side. 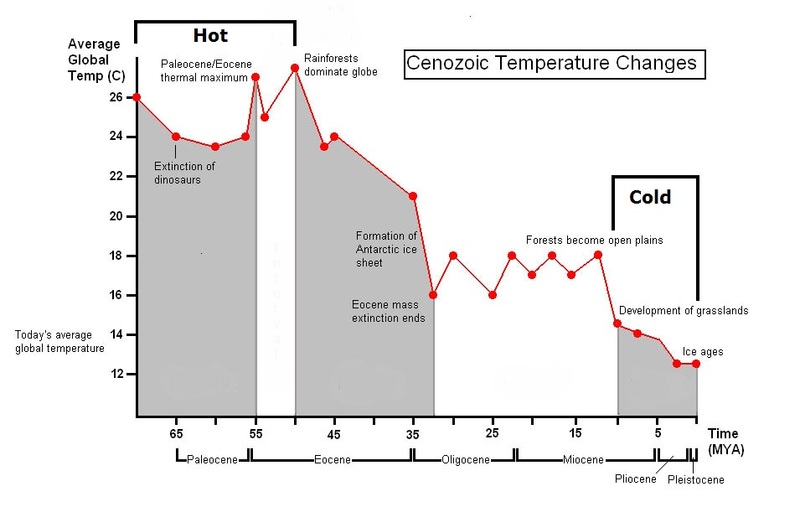 Go back 55 million years ago, to a time with the catchy name of "Paleocene-Eocene Thermal Maximum" (or PETM) and the average global temparature was around 28 C, or around 82 F.
Now before you go saying "wow, that's more like it!" and making plans for an Eocene beach holiday, one should look at what this "average global temperature" stuff actually means. It's an average of temperatures from the equator to the poles. At the moment, the gradient between tropical and polar temperatures is a steep one - we have deserts and rainforests around the equator and ice at the poles. The reason that the average temperature was so much higher in the early Cenozoic is that the poles were ice-free. There are several theories for why this might be, the most likely one being a combination of higher levels of greenhouse gases in the atmosphere, the absence of ice to reflect solar radiation, and the fact that continents were in a different position to where they are today: in the northern hemisphere, this made it easier for warm waters from the equator to reach the Arctic; in the southern, the close proximity of South America, Australia, and Antarctica meant that there was no deep water current to isolate Antarctica's climate and promote the formation of an ice cap. How we got from there to our rather chillier world of today is a fascinating story, and if you want to read more about it I highly recommend Don Prothero's book, "Greenhouse of the Dinosaurs." It's a story that we want to tell in our new Cenozoic Hall at the Peabody Museum, for a couple of reasons. First, you can clearly see the effect of the changes in the fossils that we house in our collections - the rainforest-adapted animals and plants of Eocene Wyoming look nothing like the open-woodland species that you find during the Oligocene, or the grassland-adapted species of Miocene. The second reason is that its vitally important that people understand that the world's climate is a dynamic and ever-changing system. The greenhouse gasses that made Wyoming a jungle 55 million years ago are having the same effect on the climate today. The difference is that it's happening so fast that we can actually see it. Will the world get as hot as it was in the Eocene? Probably not - even the most apocalyptic estimates of global warming only predict an average rise of around 6 C. Will it mean the end of life on Earth? Probably not, although many things that we care about (and a vast number that we don't even know exist) will probably go extinct. Will it mean the end of us? Perhaps - we depend on agriculture, which flourishes in the temperate belts that girdle the planet above and below the equator; if those belts are pushed northwards, into areas with a smaller landmass and a shorter growing season, then a lot of people are going to starve. So, how do we go about telling this story in a museum display? Well, as I discussed in an earlier post, Zallinger's mural "The Age of Mammals" - a fixture in the Hall - is a great help because it clearly shows the transition in the climate over the Cenozoic. At the beginning, pythons and colugos frolic in a Paleocene jungle; by the Eocene, they have been joined by a bunch of lumpen archaic mammals; in the Oligocene, a rather attractive open woodland environment (it looks like English parkland in the manner of Capability Brown) is populated by camels and protoceratids; then, crossing a lily-strewen river where oreodonts and anthracotheres cavort, we come to the parched brown prairies of the Miocene; and finally, after a blink-and-miss-it transit of the Pliocene, we arrive at the autumnal world of the Pleistocene, all fall foliage and snow-capped mountains, with shaggy mammoths and giant beavers. And why do people always laugh when I say "giant beaver?" The trick, of course, is to focus the story on the changing environment without falling back into the "walk through time" approach that I discussed in the last post. There are some good practical reasons why we don't want to do this, of which the main one is material. The Peabody VP collections are rich in spectacular specimens from the Eocene and Oligocene, modestly (but still respectably) endowed with Miocene and Pleistocene specimens, and possess little or no display-worthy material from those two red-headed stepchildren of the fossil record, the Paleocene and Pliocene. A hall which followed a geological time layout would begin with a display of multituberculate teeth, turtle scutes, and champsosaur fragments, which is all well and good but unlikely to send you on your way through the Cenozoic with a spring in your step. In the end, when we looked at the chart of temperature against time, it was clear that the basic story we wanted to tell was "it was hot, it cooled down, and now it's cold." In other words, three periods, which we have loosely termed "hothouse," "icehouse," and "transitional" (yeah, I know - we're still trying to find a catchy name for that third one). If we open up the old doorway to the Hall, which lies under the river in the mural, then you'll enter the Hall between the hot and cold "poles," each of which will contain one huge, anchor specimen - think of them as fullfilling the same role as, say, Sears and Macy's at the mall. In the hothouse this will be the skeleton of the giant titanothere, Brontops (or, more correctly, Megacerops), whose enormous, low-crowned molars were adapted to feeding on soft, subtropical vegetation. At the cold end, it will be our mastodon skeleton, whose owner browsed in cold spruce forests during the Pleistocene. And what about the stuff that lies between these two poles - the equivalents of the baseball cap store, Victoria's Secret, and the creepy Thomas Kinkade gallery in our paleontological mall? I'll discuss the process of coming up with a preliminary list of specimens in the next post on the galleries.